Making palatable wine for the masses is both an art and a science, and winemakers on Long Island have risen to the challenge. Jamesport Vineyards, Jamesport, NY 11947. Long Island, NY - June 5, 2018 - What began as potato fields and pastures on Long Island’s eastern crest has evolved into an extraordinary realm of viticulture. The stretch of countryside extending east of Riverhead has transformed into wine country in the last 40 years, a scene reminiscent of Napa or Bordeaux. Although the North and South Forks both encompass our wine region, the North Fork’s temperate climate and sandy, loamy soil is the perfect recipe for grape growing. The landscape of the North Fork is fashioned by expansive, tidy rows of grape vines stretching as far as the eye can see, and over 70 tasting rooms mark the way along the two main roads to Orient Point. A myriad of grape varietals are grown here– chardonnay, pinot grigio, sauvignon blanc, merlot, cabernet franc, pinot noir, and more – and our region boasts award-winning wines in most categories. Skillful winemakers are also creating beautiful blends, bubblies, blushes, and more, rounding out the menu of remarkable styles. The proprietors of Long Island’s vineyards and wineries are families, couples, and partners, living out what appears to be a sacrificial dream. Making palatable wine for the masses is both an art and a science, and winemakers on Long Island have risen to the challenge. The last 20 years have brought significant changes and improvement to the quality of our region’s wine, from mastering how the grapes are cultivated to fine-tuning the creation process through research, technology, and trial and error. This has resulted in richer, more vibrant, and more desirable wines. In the beginning, as the region emerged on the wine-making map, both consumers and connoisseurs alike were making unfair comparisons of our wines to those around the globe, most notably California. And although our wines are far superior today than they were two decades ago, they retain their inherent qualities indigenous to our locale. Long Island wines are to be celebrated for their unique virtues and essence of our environment. When visiting wine country, take note that the wine itself is not the only lure. The tasting rooms are as enticing as the vintages, each displaying its exclusive character through motif and setting: Sparkling Pointe with its sophisticated and chic ivory interior; Sherwood House Vineyards’ bucolic refurbished farmhouse crafted with locally reclaimed wood; Kontokosta’s idyllic retreat on the Long Island Sound, the only vineyard with a water view; and the picturesque Croteaux Vineyards gently set amidst flora and natural beauty. You do not need to be an oenophile to appreciate and enjoy Long Island Wine Country. The area offers plenty as far as events and entertainment, with each winery hosting musical talent, art shows, and fairs and festivals, throughout the season. The North Fork has also become a robust foodie scene in recent years, with distinguished chefs, farm-to-table cuisine, and fresh, locally inspired dishes taking precedence. Discovery and exploration is part of the journey, and the most ideal way to sip and sample is to hop on a tour bus or take a limo to allow visits to multiple wineries. 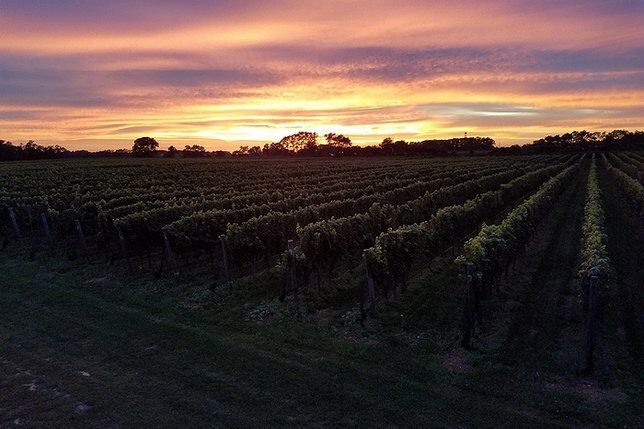 Click here for a full list of Long Island's wineries or you could skip the list and choose from our list of local vineyard tour services. Whether with it’s a special occasion, romantic escape, or a day out friends or family, spending the afternoon in Long Island’s Wine Country is an experience not to be missed. Subject: LongIsland.com - Your Name sent you Article details of "A Journey Through Long Island’s Wine Country"